Qublix has released its newest match-three game on Facebook, Crystal Island. The game takes players to an uncharted island as they search for the Tears of Poseidon. Each level has a limited number of moves, and challenges players to drop amulets and relics to the bottom of the game board before those moves run out. Crystal Island offers traditional match-three play, as gamers create matches of three or more like-colored gems to remove them from the board. Creating matches of four or more gems, or those in a special “T” or “L” shape, triggers the formation of power-ups on the screen. These boosts may clear whole rows or columns of gems from the board, or simply destroy small clusters of gems when they’re used in a match. Before each level, players have the opportunity to purchase boosters to help them out. Another set of power-ups is available after a level begins. These are all available to purchase with coins, which are earned in small quantities for free, or can be purchased with real money. These powers may add additional moves to the counter, or swap the location of some gems on the board, as examples. Players earn up to three stars on each level, depending on the number of points they accumulate before completing the level’s goal. Gamers can replay levels to earn missed stars or simply increase their high scores. 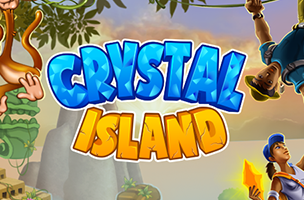 Crystal Island is now available to play for free on Facebook. Check back soon to follow the game on AppData, our tracking platform for mobile and social apps and developers.